Herbert Marshall McLuhan (1911-1980) received his PhD in English literature from Cambridge University and taught in the United States and Canada. He is best known, however, as the founding father of media studies. McLuhan was Director of the Center for Culture and Technology at the University of Toronto. Among his ground-breaking works on the psychic and social dimensions of communication technology are The Gutenberg Galaxy (1962); Understanding Media: the Extensions of Man (1964); and The Medium Is the Massage: An Inventory of Effects (1967). 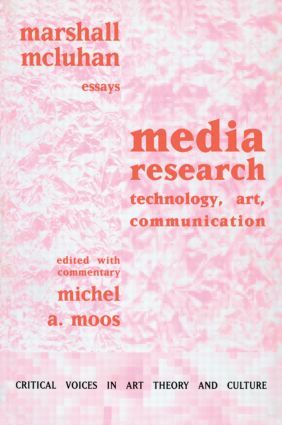 Michel Moos' premise is that Marshall McLuhan's importance derives from his achievements in rethinking the entire process of education and training itself, not with his popular fame as media guru, and he analyzes McLuhan's work from the feedback effect his vision continues to provide, rather than from the perspective of interpreting McLuhan's pronouncements on the electronic media. Moos contrasts McLuhan's thoughts with those of such thinkers as Roland Barthes, Fredric Jameson, Friedrich Kittler, Donna Haraway, and Deleuze and Guattari, and renders an updated account of the effect of the mass media on our society and ourselves. The concept "the medium is the message" is the hub around which Marshall McLuhan's explorations revolved. McLuhan's interests ranged from sixteenth-century literature to twentieth-century business practices. With wit and literary flair, he reported the media's influence on society and on the individual. He concluded that we could not escape being transformed by the forces that are hidden deeply within the electronic telecommunications revolution of the sixties. For McLuhan, the new mediums of film, television, and the emerging realm of the digital were the modern equivalent of Gutenberg's printing press. Essays by M. McLuhan. Edited and with a Commentary by M.A. Moos. "A fully fleshed-out new 'take' one McLuhan…Moos has achieved what would seem a very difficult thing, namely to suggest the implicationsof a kind of language that moves beyond what we can fully understand…a startling and sobering reading of McLuhan."